Winmate's Access Management System - a new Product Line for your safety! Property security and personal safety has become a top priority for business associates. Winmate's newly launched Access Management System (AMS) provides a flexible hardware design and device SDK for users to develop software according to their specific demands. AMS is an advanced access security management system with rapid data control, Radio Frequency Identification (RFID), Motion Sensor and Digital Input with Digital Output Technology. It can be used for Campus Entrance security, Access Meeting rooms in hotel complexes, and Resource control in corporate offices. AMS can be a mobile work desk, Identifier, and library booking service. This is a versatile Access Management Solution which can be installed and configured in a variety of ways. Access Management System is key-free, avoiding the risk of key duplication and illegal intrusion of your property. The modern design of the stylish housing suits most environments. Various colors are available to match your interior design. The thermal interior design allows long term operation in 7/24 applications. The RFID Reader and other IO devices such as Barcode readers, Swipe cards and Smart cards can be customized and added according to your requirements. All-in-one Design, completed solution for cost-saving and space-saving. 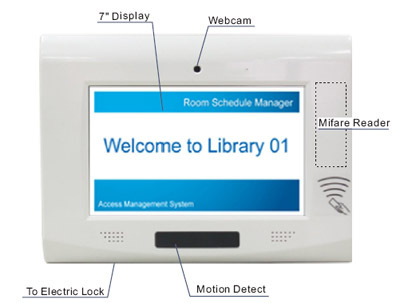 Winmate Access Management System (AMS) has integrated Touch panel, DI/DO (Digital input/Digital output) and 1.3 M digital microphone and camera. For access applications, our AMS DO module can control electric lock directly without any extra power source. Multi-functional usage, no longer only access control. Based on x86 architecture, Winmate AMS is built in the newest Intel Atom platform, which is more powerful than the general RISC-based access control system. Environmental Friendly and Power Saving. Integrated with Infrared Motion Detector, Access Management System is equipped with power saving mode that will be standby mode while no users are around, and vice versa, consequently reducing resource waste as well as extending the product lifetim. Mifare Card Reader and Motion Sensor, non-contact and energy-saving. The latest RFID identification reader enables the AMS to be integrated into applications with sophisticated automated identification requirements. Motion IR sensor, wake up the AMS when approach, save your power consumption and extend product's life. Providing Dual LAN Module RJ-45 equipped with Access Management, Security Mode on/off, Controller Reset...etc. Real-time web monitor, built-in DI/DO module, instant function (door open/ close and security etc...) status feedback. 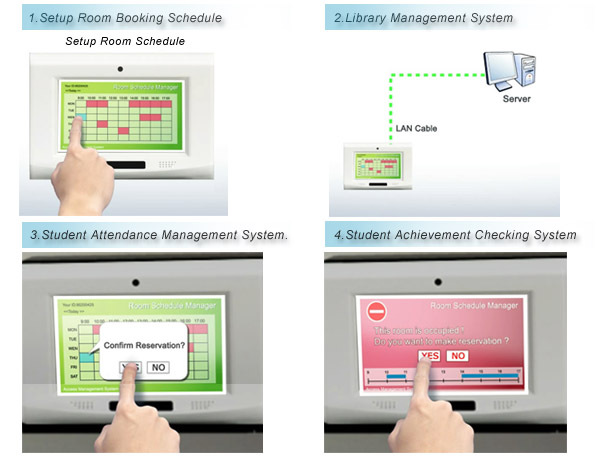 Schedule and resources management aimed at room utilization such as classroom, conference room and Audio-visual room which greatly reduces the waste of resources. Authorization management system with 3 modes of authorization including management, users, and staff. User can also set authorization modes according to specific demands. Watchdog function to reboot system when detects abnormal condition.